Douglas Laboratories has been developing and manufacturing nutritional supplements since the mid 1950s. Their products focus on the aging and active lifestyles of consumers. Douglas Laboratories has multiple products aimed at supporting the endocrine system. Their flagship supplement for supporting healthy thyroid function is ThyroMend. ThyroMend contains one mineral and a lot of herbs. 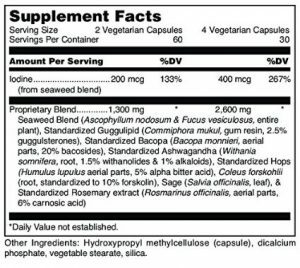 According to the supplement facts label, ThyroMend contains Iodine, and a proprietary blend of Ascophyllum nodosum, Fucus vesiculosus, Guggulipid, Bacopa, Ashwagandha, Hops, Coleus forskohlii, Sage, and Rosemary extract. Iodine is one of the essential nutrients needed for healthy thyroid function. So, it is very good that they included it. The herbs are certainly useful as well. They could help with stress relief and anxiety. However, there seems to be a lack of other important vitamins and minerals such as Vitamin B12, Magnesium, Zinc, or Manganese. According to their website, Douglas recommends you take 2 capsules with food for the first two weeks, then 4 capsules with food for the next 4 months, and then back to 2 each day with food. Douglas seems to have very good company practices. They invest into research, quality assurance, and education. Douglas Laboratories are also socially responsible, partnering with SOS Children’s Villages International to help provide child care and education to children. According to this article, Douglas Laboratories also has strong safety standards in their supplements to make sure that they are not tainted with other substances. This is very important for athletes who cannot take illegal substances. There does seem to be some sort of refund system in place. As stated their website, it requires requests to be made within 30 days from receipt. However, their refund policy also states there needs to be preauthorization. I do not know what that entails, but it seems like you will have to jump through some hoops. Finally, Douglas Laboratories also charges a processing fee on returned items. Whether it is all worth it to go through this process, is up to you. Our research notes that most reviewers may feel a small difference although it will certainly take time for the supplement to fully work. The herbs will help with stress relief if taken daily. Some of these herbs have even been noted for supporting fat loss according to some websites. The lack of other minerals, vitamins, and amino acids other than just Iodine is concerning, however. Since a lot of thyroid nutritional defects come from sources other than just Iodine, it would have been helpful to have them in this supplement. It is likely someone would need to take another supplement in addition to ThyroMend to make sure they cover all of their bases. Our research did not highlight any significant side effects. A small percentage of reviews seems to have noted bloating. All other reviewers did not note any side effects. ThyroMend costs $51.30 on their website. That is without shipping, however. Free shipping is only offered on orders over $100. Furthermore, there is no discount if you purchase multi-bottles.